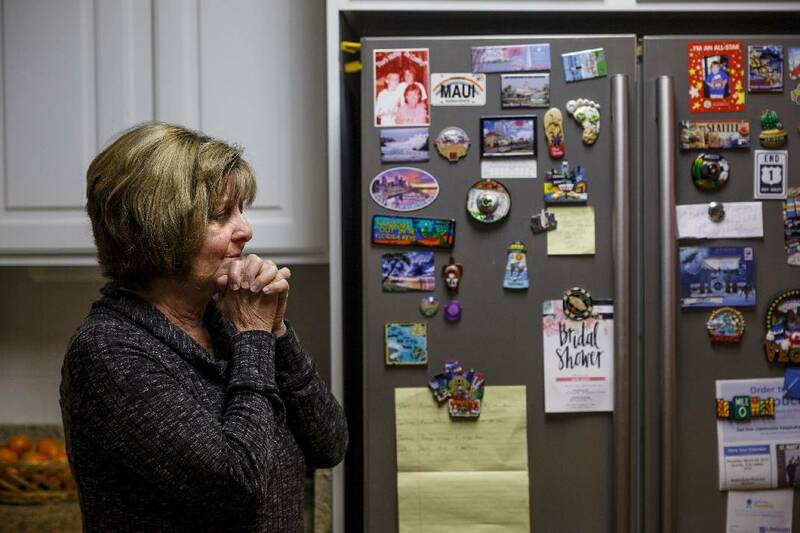 Staff photo by Doug Strickland / Mementos from Diana Parkinson's vacations with her husband Mark are displayed on the fridge at her home on Wednesday, March 7, 2018, in Rossville, Ga. Her husband, Mark, was shot through the window and killed by an unseen Walker County Sheriff's deputy on the night of Jan. 1 after he walked into his kitchen with a handgun in response to his barking dogs, his wife says. LAFAYETTE, Ga. — A Walker County deputy who shot and killed a man in his kitchen on New Year's Day has been cleared of charges. A grand jury found that Deputy John Chandler did not act with criminal intent when he fatally shot Mark Parkinson through a window. The grand jury reviewed evidence in the case presented by a prosecutor Tuesday. Its conclusion matches that of an internal investigation by the sheriff's office in January, when department administrators found that Chandler did not violate any policies or commit any crimes. "We recognized it was a tragic, tragic situation," Sheriff Steve Wilson said Wednesday. "We still support the facts that the officer acted within policy and within the laws of the state." Diana Parkinson, the victim's widow, expected that result and went on a Caribbean cruise to try to keep her mind off the case. Her effort worked until she heard the news Wednesday. She believes the grand jury should have indicted Chandler. "It makes you feel defeated and mad and more determined than ever to bring it to civil court and get something done the correct way," she said from a ship off St. Thomas. "They won't get the best of me. I will fight it the best I can. It's not going to just go the way they think it will. I'm not that type of person. If this had been an accident some way, I would have a whole different outlook on it. But it wasn't an accident." Chandler and two other members of the sheriff's office responded to Parkinson's home in Rossville around 3 a.m. on Jan. 1 after receiving a complaint that a woman inside threatened to kill her children and herself. The complaint was not legitimate, GBI agents later determined. It was part of a custody dispute. Parkinson's daughter, Amy Gass, is in the middle of divorce proceedings with Stephen Gass. Her mother-in-law, Dorothy Gass, told a 911 dispatcher that Amy Gass had just made a threatening phone call. GBI agents later concluded that Dorothy Gass made that allegation up; phone records showed Amy and Dorothy Gass did not talk that morning. When officers arrived, dogs inside the home barked. Diana Parkinson said her husband woke up, grabbed the handgun on his nightstand and walked into the kitchen to check on the noise. He flipped on a light. From the outside porch, Chandler saw a man with a gun pointed in his direction, the deputy later said during the internal affairs investigation. A sergeant outside shouted "Sheriff's office!" Chandler ducked. When he rose and peeked through the window again, he said, he saw Parkinson still holding the gun in the same direction. Chandler fired three shots, killing Parkinson. "He meant to do me harm," Chandler later said during his internal affairs interview. Diana Parkinson said Chandler should have stepped back and called the home. "Most men in the South have their guns, to protect them from home invaders and stuff like that," she said Wednesday. "Everybody who's talked to me said, 'That could have been me. They could have done the same thing.'" Georgia Bureau of Investigation Special Agent in Charge Greg Ramey said his department conducted the inquiry the same way it would any other homicide. They presented their evidence to Lookout Mountain Judicial Circuit District Attorney Herbert "Buzz" Franklin, who was free to present what he believed was the most pertinent information to the grand jury. The proceedings are not open to the public. Another prosecutor could re-open the proceedings. But State Court Solicitor Chris Townley said Wednesday the case is essentially locked away because of a legal technicality. Townley, who took office Sept. 1, worked at the same law firm as an attorney representing Dorothy Gass' son in his divorce to Amy Gass. Townley takes the position he is not allowed to touch the case. In theory, he could recuse himself and bring in an outside prosecutor. But because the charge was already dropped, even re-opening her case would require action by him. He said he told his predecessor, Pat Clements, that he was the only one who could file charges against Dorothy Gass again. Clements retired at the end of last week. Dorothy Gass' case file shows no action since the charges were dropped.